Today it is my great pleasure to participate in signing ceremony between Ambassador of Japan to Timor Leste Mr. Yamamoto and JDRAC. I cannot forget the guidance and support from ambassador to Timor Leste Mr. Yamamoto and government officials of Timor Leste. This year is the first year of three-year plan. JDRAC construct simple maintenance andtraining garage in Comoro and give the basic education and training to trainee from Comoro automobile inspection center. From the second year on, JDRAC will give auto mobile inspector training to at least 30 or more people. Trainee is picked up from government officials and Comoro automobile inspection center. JDRAC would like to request government, organization of Timor Leste to recruit female trainees as many as possible. 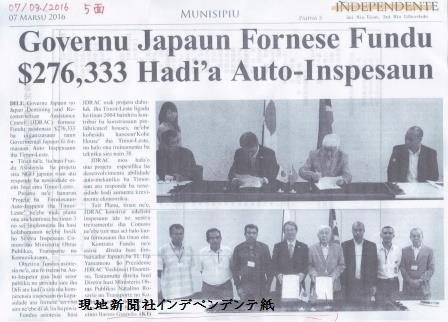 At the same time, JDRAC introduce Japanese automobile inspection system to Timor Leste to recognize the difference between Japanese automobile inspection system and Timor Leste’s system. This introduction is expected to be the opportunity to review the inspection system in Timor Leste. At the same time, Automobile inspection conducted by private agency is introduced that is essential in the future in Timor Leste.. Finally, JDRAC always never forget “For the Timor Leste” spirit, and carry out the project with “O MO TE NA SHI” means the essence of Japanese hospitality and “YAMATO DAMASHII” spirit. I will greatly appreciate further guidance and encouragement of every one. Thank you very much.